I am looking forward to viewing everyone's aquarfleurs this week. 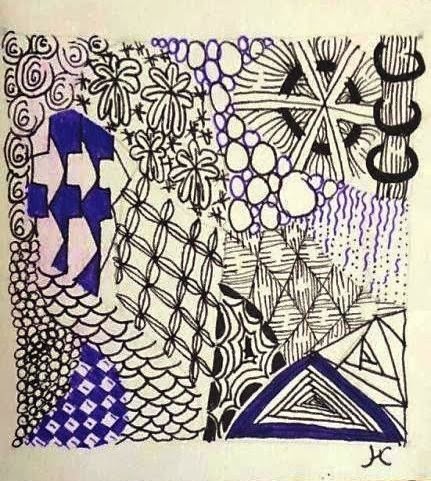 This is a really gorgeous tangle created by Maria. 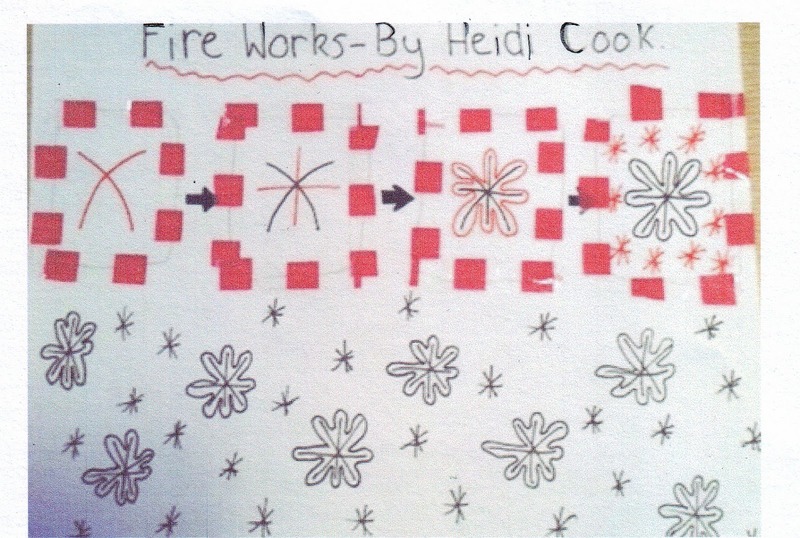 After our Australia Day celebrations Heidi was inspired to create this super tangle which she has called fire works. And this one by me. Shelly, your Aquafleurs are beautiful. Lovely, gentle composition, #1 tile. Lovely. I love all three tiles. Your work always inspires me! Heidi seems to be following in your footsteps! Morgana, I have heaps of favourites that I tend to use a lot and I often concentrate on one tangle for a couple of weeks and incorporate that as much as I can until I get really familiar with it. 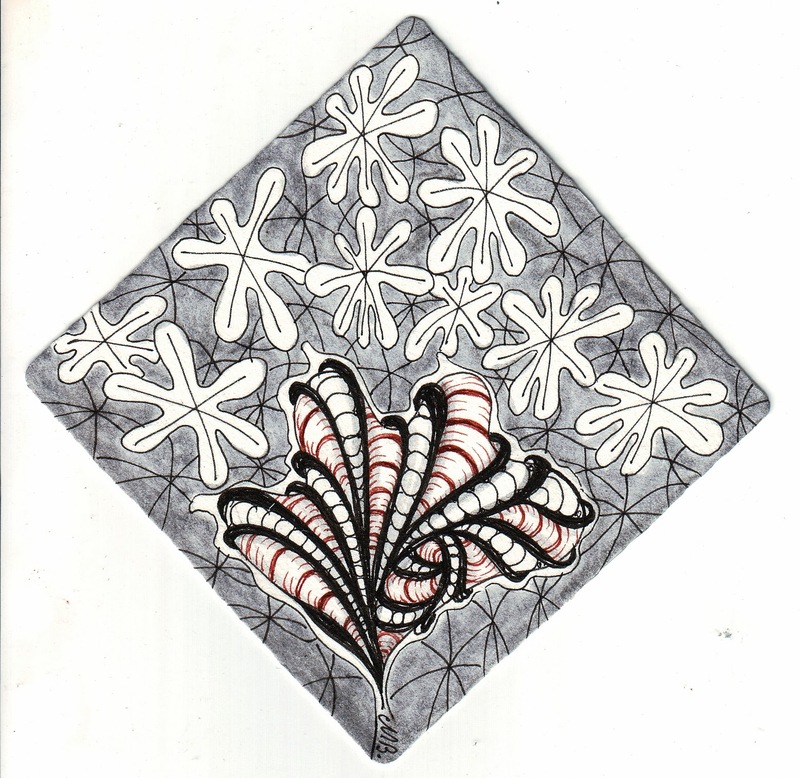 At the moment I am loving squill that's the tangle with the green in the 2nd tile. I usually just use the 1st one that pops into my head. Thanks for asking. What beautiful examples of Aquafleur you've given us. I love them all. And Heidi is showing great promise! 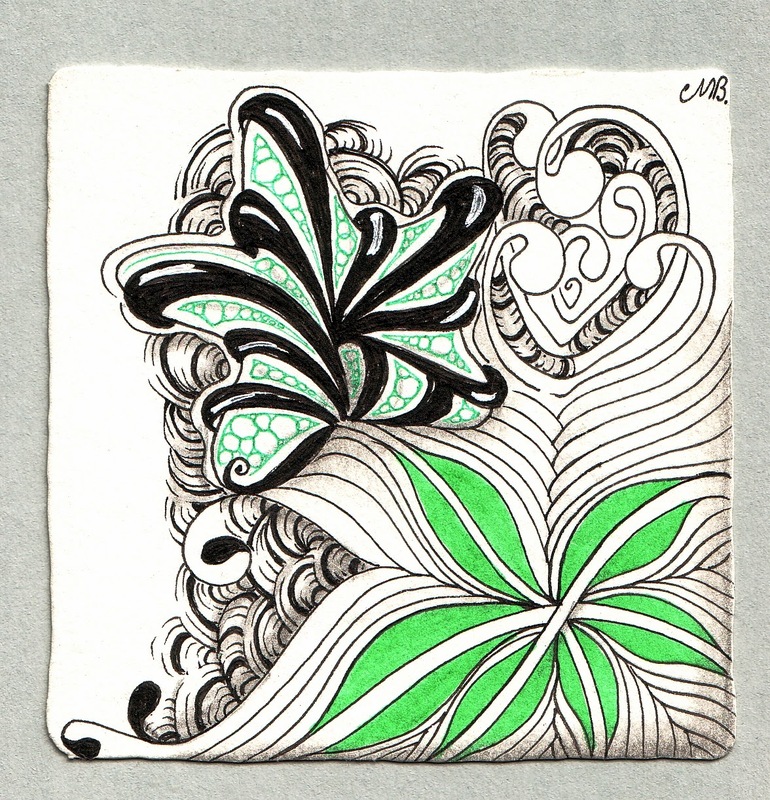 Beautiful Shelly, I am always inspired by your work, the subtle border you made in the first one, oh I love that. Great work! After visiting your blog I always want to take my pen and start trying to do myself. I love your compositions. Very lovely! I can't wait to try this tangle. Aquafleurs are beautiful and I love your first tile. I am fairly new to tangles but am so inspired with them. Maybe one day I'll join in this party.. Have a wonderful week! Really nice Aquafleur tiles. The top one is my favorite because the wide black is such a dramatic contrast to the white. Beautiful! I love all the white space in your first tile! I could look at your art all day long! You are so creative and inspirational to me. You have such a lovely line quality in your tiles. It is so fun to see them! What an inspiration you are! each line shows the eye a new treat! Beautiful, elegant and organic. Lovely! All three tile are beautiful and very elegant! 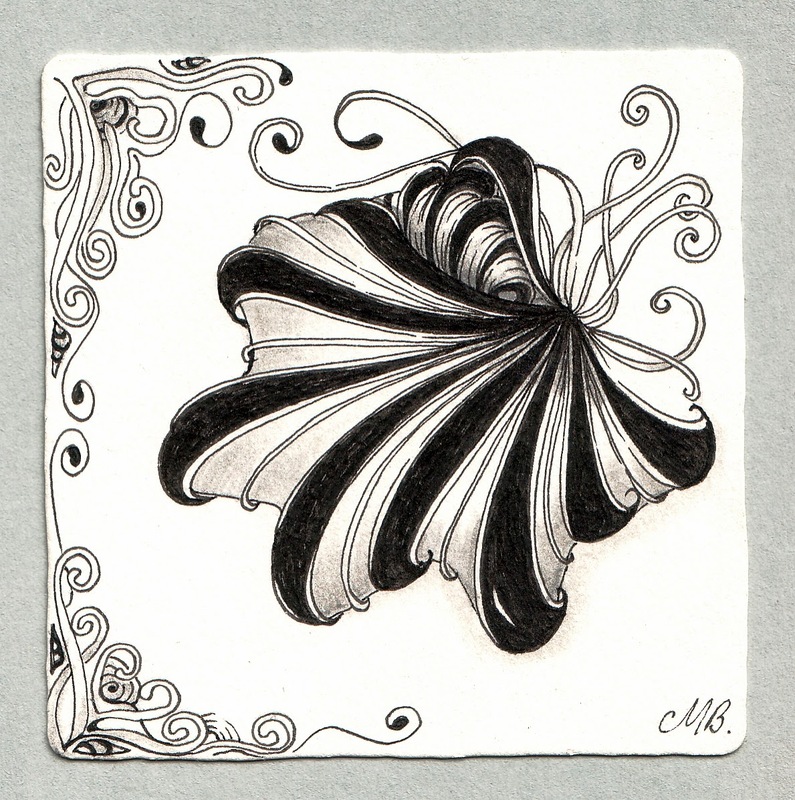 Heidi´s tiles are very lovely, too! She is very talented! Both look great. I like how the simple addition of the border in the first one adds so much to the tile. Like the color in the second. I do not use it a lot but yours just makes the whole tile stand out. Your work is so beautiful! I like the added splash of green but the top aquafleur is my favorite -- it appears that is opening up, continuous. Breathtaking tile. Shelly, I just discovered your blog through Pinterest. What a delight! I look forward to looking back through time at your previous posts, then will follow you into a very artful future! Your pieces are compelling and lovely. I love the delicate lines you used in the first one! Great work! Your Aquafleur pieces are so beautiful! I especially love the scroll work in the first one. So pretty. These are yet again so beautiful. I do admire your work. REminds me a little of "Birdie Feet" which I also love. Thank you, Michele, for again sharing your your spirit-filled talent with us and sharing your family as well as their creative works with us!! Heidi, Your work is lovely & inspiring! Thank you, too, for sharing :-) Tangle On!!! Yes Gunnel, it's a great tangle, I'll send you an email of the steps.